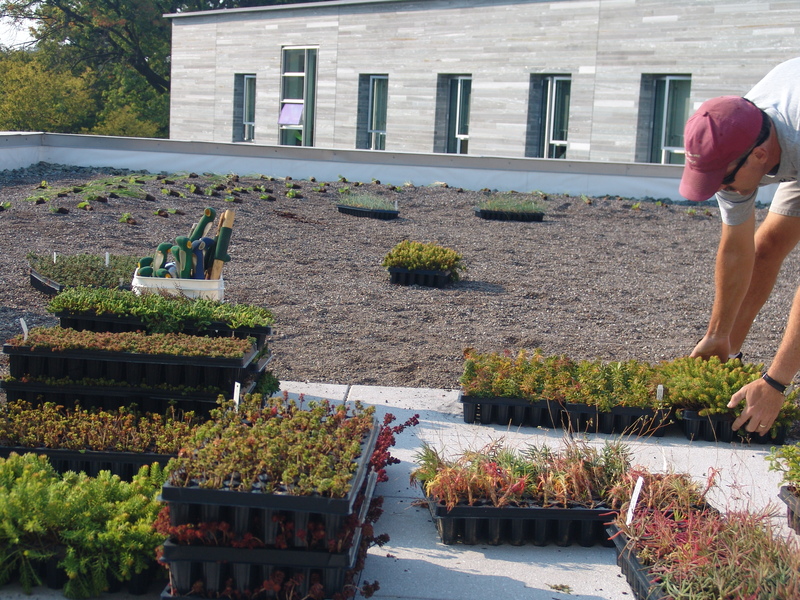 Yesterday, we discussed how the majority of the Kemp Hall green roof was planted. Today, we will explore the remaining level and the excitement that a few more inches of growing media can bring. The remaining level was planted using a different technique because it is the semi-intensive section. 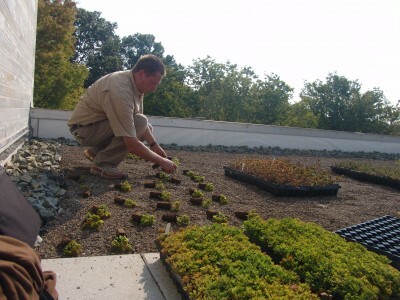 This portion of the roof features mounds of the growing media eight to ten inches thick allowing for planting of perennials and bulbs, and a paver area to allow tours to step out onto the roof. 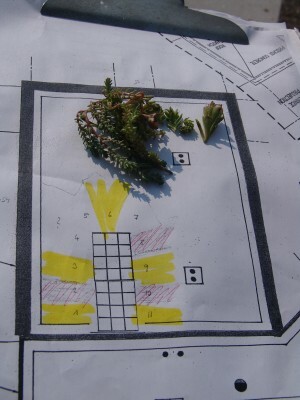 To plant this portion of the roof, plugs were used instead of cuttings. Plugs were chosen because they allow the designer to create precise, highly individualized design. 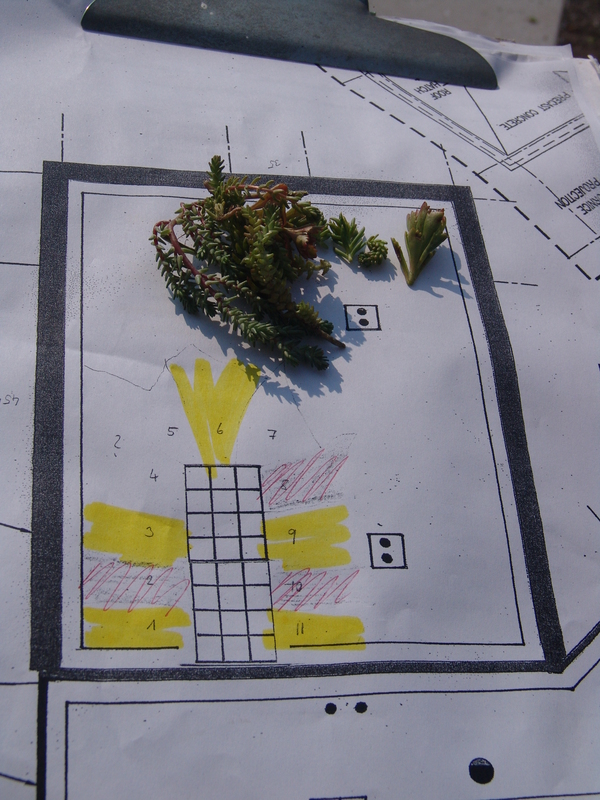 Using plugs of various types of sedums, large swathes of color were created radiating out from the paver section on the roof as seen in the sketch below. As Ed Snodgrass describes in his book, Green Roof Plants: A Resource and Planting Guide, hardy succulents are the workhorse of extensive roofs.The Kemp Hall green roof puts these workhorses to the task on all five levels of the roof. 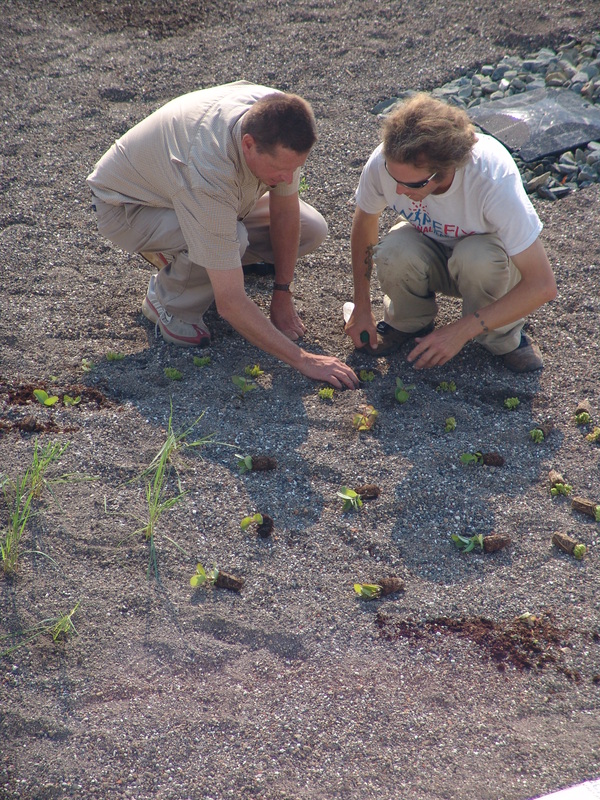 Because this is the semi-intensive level of the roof, a variety of grasses, bulbs, and annuals were planted in the growing media mounds. Grasses add texture and motion to the roof landscape and a habitat for birds and insects as they do in a traditional landscape. The grass, Calamagrosits xacutiflora ‘Karl Foerster’, was planted to mimic the plantings on Alice Paul green roof which can be seen from Kemp Hall green roof. These grasses can also be seen blowing in the wind from the Chester Rd./Route 320. Several types of accent plants were added to this portion of the roof as well. Accent plants do not grow as rapidly as groundcovers and offer seasonal interest. 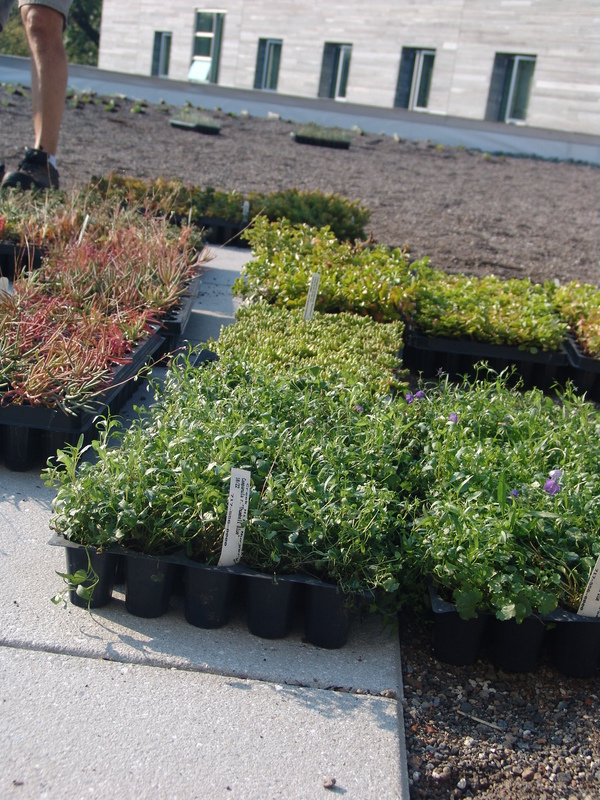 Accent plants also do not have as long a life expectancy as groundcovers, thus requiring periodically replenishing. 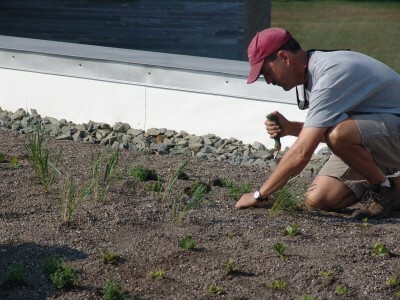 I’m designing both “extensive” and “intensive” green roof(s) for a project in Cecil Co. MD and need some advise on the “intensive” green roof planting. Can you help??? Please email me and I will describe more. Thank you for your inquirer. Our roofs are all extensive with expect for small sections that are semi-intensive. I would recommend contacting our designers.